I can see brows furrowing at this title. Keep fuming. I am still talking. 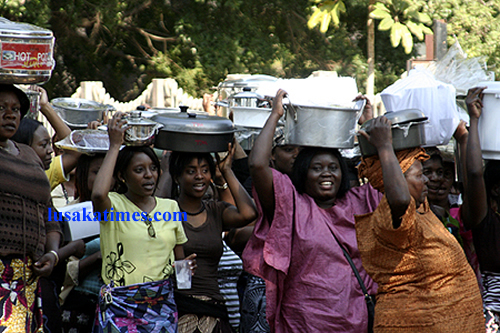 Because everywhere in Zambia, Canters are being loaded with dishes of food and singing women in matching chitenges heading off to serenade some man for being a husband. Think about it. Two people fall in love, build a home and family together and only one of them gets the accolades with Amatebeto. In the old days, this may have made some remote sense when men were the sole providers of the family, but in modern times, Zambian women are doing more than their share in holding families together. They are employed, they have children, they cook, they hustle, they fight side chicks (Ask Tisa the Trendsetter) and yet they keep their heads down and put their men on pedestals. This frustration is now manifesting in violence on men from women. I was very annoyed the other day when I received a WhatsApp notification from my niece, Chisha, to form a family committee as she was planning Amatebeto for her husband, John. They have been married 8 years and have 3 children. Chisha has held down a steady job as an Accounts clerk since before meeting John while he has fleeted from one failed business venture to another. Chisha, inspite being only 36 years old, has aged rapidly since marrying John. She has gained weight and her breasts have never recovered from her pregnancies and breastfeeding. Anyway, when the WhatsApp notification came, I expressed to Chisha that I could spare her money for a breast implants and gym membership or alternately I could contribute to a life insurance in John’s name not to the abomination of Amatebeto. As you can imagine, the entire family has ceased speaking to me. Good riddance! Regardless, I still insist that John should give Amatebeto to Chisha for being an excellent wife and a provider for both his dignity and his loins. women must demand alagizi for their betrothed with extensive teaching on how to handle a modern Zambian woman before going to the altar. The time is now for Zambian women to flip their Brazilian weaves, click their Chinese heels and claim their place in the home as equal partners. It starts with demanding Ukutebetwa. Claim your glory! Additionally, women must demand alagizi for their betrothed with extensive teaching on how to handle a modern Zambian woman before going to the altar. The Bembas go further by taking Amatebeto to a rogue they don’t even know well (Amatebeto before the marriage even begins). Note that this change in culture will render a few job seekers without a source of income, most of who are women. Some come out of the process with a free 3 or 6 metre chitenge, while others just want ‘a party’ or a reasons to drink and these are fellow women. Like most of the traditions and beliefs alike, there ought to be a change. The bible says…, the Holy Quran says…, So what? Tradition and Religions need to transform to align themselves to modern times. For example Amatebeto need to be the couple’s house for the couple for either side to celebrate the two parties or just have a party really. Ba princesless, whatever you call yourself. You could have put forward your point without degrading yourself. You sound like a frustrated & confrontational woman. Your point is taken. But if you rightly asking that women need to be appreciated also through matebeto then you headline is off. Matebeto is a custom. Only it was for men. Yes,it makes sense that women be tebetoded also. Except for these cheating ones we are hearing of everyday. Women have also been cheats for years. Most men are fathering children that are not theirs. So advocate for the good women, for whom you don’t seem to be one of those. Yes ‘Things will never change’. You will remain poor countries if you do not change with the times, especially if you do not embrace such reasonable opinions from one of you. Nubia filekefye fyalibelela ukucula! Let’s just do our Christmas shopping babe! @Nubian Princess great article but your tone is bitter. I think you should have titled your article “No Matebeto For Losers.” Am one of the girls who wasn’t so much into culture and tradition before I left Zambia but now I have fully embraced it. If you beat your wife, don’t provide for her and your children, an unrepentant womanizer who disappears on weekends and only show up Monday mornings, then loser you don’t deserve matebeto! @Nubian, what’s going on with your love life? What are articles, the other week your attacked female organs. Now this. ANALYSER Chilangamulilo and Matebeto are two different banquets. Please if you do not know Bemba culture do not confuse readers. @Wenye there is nothing you are telling me that I don’t know! Chisumina nsalumo, matebeto, chilangamulilo and matebeto are all a load of rubbish, man. The Bembas do all these before the marriage even starts while others like the easterner will do matebeto after years of marriage to thank the man ‘for looking after the woman well’, which I believe is being rightly disputed by Nubian Princess. I agree with her disputing some of these primitive tradition and I am saying that religion as we do it needs to also change from the old traditions. @Nostradamus read through the other Nubian Princess’ article again and this time think about what she is saying. She’s not attacking female organs, she’s consistently attacking traditions as I understand it. dumb! They are very quick to knock down their tradition but are scared to question their beliefs based of fiction!! It’s culture that makes who you are. Why didn’t you talk about two people getting married but only one gets the accolades of being honored with lobola? Matebeto and Chilanga mulilo are now our national heritage, despite the roots being from Northern Zambia. Even foreigners are hosting matebeto and Chilanga mulilo. We will continue to pay lobola for all our women for a hand in marriage even for those that can’t remember when they lost their virginity and to who? @2;John provided the seed, kikikiki! Well it is Chisha’s body who carried the babies and endured labor while John did all but 30 seconds! So who deserves matebeto here?! How can one talk about ‘matebelo in 2018 and not talk about that of these crooks with new found loot like Amos Chanda’s where even buses were hired…how can this “feminists” XXXXXX Princess talk state that a tradition is redundant…wont go further..this lady expects us to leave comments here when she hardly leaves any on other people’s articles except three words. Progressive but Amatebeto don’t come anyhow. You need to work for them. Nothing wrong with this African tradition. These nubian princes types are the same African woman full of fake European hairs covering their African hair which they are ashamed of…..busy trying to look white yet look riddiculus with white people’s hair……. My mother did amatebeto for my wife for having kept our clan happy. Otherwise you are right. Ama what? I don’t believe in that. Even if a marry a bemba woman I can’t accept that to be done. Yes, Chisha may be your cousin, but she finds it fit to tebeta the husband, why are fuming on your part? You Sound like a womanwho have had multiple failed relationships and now you want every other woman to disrespect men. Put yourself together and have some culture identity woman! Leave Chisha’s marriage alone!! Nubian Princess is discussing something without researching. This is not journalism but rabble rousing. Ba editor Nabo bushe efyaku publisha if I? It’s not Chisha’s responsibility to conduct matebeto. She’s not even supposed to be involved. Mulelufyanye ntambi. Mulesanga umukashana is spearheading Chilanga Mulilo and Matebeto, Why? On what basis? Ukukusefya kubili konse kwa bafyashi ba mwanakashi, te mwanakashi umwine iyo. IciBemba cakana! Ni ncito ya bafyashi yi. I agree, there is more focus on grooming a woman for marriage….not much from the men’s side…..times have changed now…..vama tradition fimo can’t suit in today’s times……ilyashi lya mauzu and what not should be done with….it really makes no sense for busy women from high class jobs with hefty salary to get home to relax only to find someone waiting to be saved….rubbish!! !fyaliko akale when women had nothing to do and were solemnly dependant on men even for a razor blade…..
From the little I know it is not a guarantee that just because you are married you will have amatebeto. It is a merit thing. It is only today that everything is like our exams – ma leakage tyala. I know gents who have passed on without earning the honor because they were just a-holes to their spouses. First abolish Dowry before you balance or do away with Amatebeto. Nubian Princess you have a good point but misplaced. Good idea but poorly expressed. Good reason but poorly researched. Have you ever asked yourself what language is the word Matebeto? Of course it’s Bemba. Not all the Tribes in Zambia practice Amatebeto. Why Amatebeto in Zambia among the old Bembas and not among the Ngonis? It’s your home work. it is done to both because equal rights.Initially, that was not the case. Now any woman wants ukutebetwa. My my friend balimutebeta ba mother inlaw bakwe what about me. This is now bringing confusion because you can’t force someone to do it. You may think you deserve it but you don’t. Maybe she does not even believe in the 20 st century of uketebeta umwanakashi. She might be convinced when a woman marries a woman and that is the time baka kutebeta. This time you will marry a fellow woman.You mother inlaw has 20 children and no one gave her amatebeto. I like the topics Nubian brings on though I don’t always agree with her. On this one, I support her reaction in the example she gave minus the part with breast implants. The complications of the surgery have left a lot of women regretting the decision. Otherwise, my opinion is that “Lobola” or “Insalamu” (Bride price) balances the equation. I stand to be corrected but I think what the man pays for the woman before and after their marriage (even after divorce) ammounts to much more than 10. 20 or 30 Matebetos. Needless to say, I like the way it’s two against the world out here whenever people fall in love. If the worst comes to the worst a German woman will even cut ties with her own family just to be one with her husband. That’s because White people are not bantus ….when an African get educated the whole village benefits…when we see a black man commit atrocities in the media it affects as a people that not so for white people. When you marry outside your race you know who benefits? The children benefit. They are mixed blessings for both sides. What mixed blessing are you talking about….utter nonsense…they just become confused only realise who they are until its too late and your name and customs are scarified. Go to Mental institutes in Europe and you will find them in there in high numbers. I couldn’t finish reading this article because clearly there is a failure to understand the link between women empowerment and our tradition.Further the thinking that because a woman has maintained an accounts clerk job while the husband has failed in many business ventures means the woman deserves matebeto more than a woman or that the man doesn’t deserve matebeto at all because the wife in your opinion is the provider.This is a complete misunderstanding marriage! Matebeto is not a reward for financial benefits obtained from a man.It encompasses more intangible things like love and respect for the wife and her family.Firther it also recognises a man’s effort as a husband and father.Failing is not failure,failure is the fear of failing! Nubian Princess must be really shallow. So you think amatebeto is for one person to enjoy. Which husband lives alone? If he were to enjoy amatebeto alone would he be human? All that food will be managed by the wife. It’s as good as hers. Dont mind her…she can not even introduce the article with the history of ‘matebeto…if she did that she would have employed a better critical analysis into the topic. OK! Agreed! But, wait a moment… Can women also pay LOBOLA or DoWrY, whatever it is that is correct! Who is being charged astronomical amounts for marriage? Fine, let men Tebeta their wives AND let women also pay dowry!!! And no one should claim gender nonsense… Some can never be changed! I would have wanted to find out the marital status of the author, but lest I be seen to be gender-biased…. Please let us not confuse with rich African traditions with contemporary undertones. Our colleagues in the West respect their traditions, for instance had the wearing of kilts, with no underwear, for Scottish men ever changed since time immemorial? You see people, this is what I always say to everyone. Do’u see what problems tradition brings when you take it too seriously. Tradition is a man made thing that is bound to change at any point to suit the need. It can either bring bad mouth or good will. That is why people can not rely on their own wisdom. When people understand the will of God regarding marriage and Family, they’ll begin to focus on the more important things unlike issues of culture. Shoot lobola down first if you can then everything else will fall off. Simple. Tradition is just a road map. You can take it or leave it. Nobody cares. How much did you pay for the sir name you are using. What’s your point bane?Your article is full of bitterness,anger and frustration.Are u okay? I can see how Zambia is still far from Gender equity. We need gender champion men to support the contribution women do in homes. I think I support Nubian on this one. I am more about the two of us, chapwa. these other things are not necessary. love one another and be in love and live your lives the way you see fit. live in your own love bubble. screw all the traditions cuz ichilowe/ichikalipa chufyo abene. save all the money from the wedding and go on vacations and put some of it into your future children’s education fund.